In my quest to backup ALL THE THINGS, I turned my attention earlier this week to the shared iCloud Photo Albums my friends and family use to pass around photos and videos of our kids. All of the items in my iCloud library (and my wife’s library) are combined and backed up to Google Photos automatically. For better or worse, Google Photos is the “source of truth” that contains all of our archives and is sorted into albums. It’s the backup I’d use to restore if iCloud ever goes belly-up. (And I have a redundant backup of Google Photos itself in case Google ever loses my data.) And the actual Photos.app library on my iMac is backed up to Backblaze for good measure, too. So the photos we take are covered. But there are a ton of great memories of our kids snapped by other people. Those only reside in the shared iCloud photo streams. How do I back those up? Ideally, Photos.app on Mac (or iOS) would have a preference to automatically import shared items taken by other people – and then those would feed into Google Photos. But that doesn’t exist. I could manually save-to-my-library new items as they’re shared, but that’s error prone and not scalable. Also, what about the 2,000+ previously shared photos? I thought I would be clever and just select-all on my Mac and drag them into my main library, but after doing a few quick tests I realized Photos.app isn’t smart enough to not duplicate the photos I took and shared when importing. (This is likely due to Apple scaling-down and stripping out metadata of shared items.) And there’s no way to sort by “other people” or build a smart album of “photos taken by other people” to filter out your own images when importing. So, I decided to do some digging. The first step was to locate the shared albums on disk. I searched my main “Photos Library.photoslibrary” bundle, but couldn’t find them inside. A quick glance through “~/Application Support/” didn’t turn up any obvious hiding places either. That’s when I fired up DaisyDisk to search for large (10GB+) folders. Each shared album is inside that folder and given a UUID-based folder name. And inside each album, every shared photo/video is itself inside its own UUID folder name. It’s quite impenetrable and obviously not meant for users to poke around, but the programmer in me understands why it is this way. At the top level is a Core Data database. I thought I might get clever and explore that to see if I could extract out the metadata of the shared items and use it to help me write a “smart” backup script (that perhaps imports other people’s photos directly into Photos.app) instead of just taking the brute-force approach and backing up the entire album as a dumb blob, but I haven’t had enough time yet to investigate. So until I find the time to build that “smart” approach, I’m going about it the dumb way and nightly syncing everything to B2. It’s not ideal, but it covers my needs for now. This entry was posted on April 19, 2019 by thall. I’m very meticulous about logging all of the feedback I receive from my customers. Whether it’s a bug report or a feature request, I want all of that information captured in a single place where I can plan and act on it. For me, that place is the Issues section in my app’s GitHub repo. Normally, when I get a customer email, my workflow is to reply back to them with any clarification I need, and then once we’ve finished with any back and forth, create a new GitHub issue with the relevant info from their email and a note reminding me to email them back when their issue is resolved. This takes all of a minute to do. But it still means opening a browser, navigating to the repo, clicking on “Issues”, then “New Issue”, and copy and paste the email details. Further, if the user supplied any screenshots, I have to save those out of the email and upload them to GitHub as well. Like I said, it only takes a minute or so, but it adds unnecessary friction. Today I decided to automate all of that. I use the fantastic Postmark service to send all of my company‘s transactional emails. They also have an equally awesome inbound service that will parse any emails you forward to them and POST the details as a JSON blob to your web hook. So, I created a forwarding rule in Fastmail to forward any emails sent to [email protected] and [email protected] to my secret Postmark inbound address. Postmark receives the forwarded email and POSTs the data to my server, which runs a small PHP script (embedded below) that downloads any image attachments contained in the email and creates a new GitHub issue in the appropriate repo with the contents of the email and image attachments. It all works great! What used to be a slightly annoying process to do a couple times a day, now takes all of three seconds in my email client – whether I’m at my desktop or out and about on my phone. Maybe you’ll find this script helpful. This entry was posted on April 8, 2019 by thall. My kids go to a fantastic daycare. My wife and I couldn’t be happier. The teachers are wonderful, they love our children, and our kids adore them, too. But, the third-party service the school uses to communicate with parents is absolute horseshit. I won’t say what the service is because I don’t want to give them free publicity or maybe even alert them to what I’m doing, but if you have daycare-aged children, you probably know it. All the schools use use it. All of the teachers carry around iPads in the classroom. They use this third-party app to check-in / check-out the children, capture photos and videos throughout the day, record what they ate for lunch and how long they napped, and (if your child is young enough) document their diaper changes. At the end of the day, after we sign them out of school, my wife and I get an automated email from the service with a summary of each kid’s day. But what we look forward to most are the photos/videos they take of our kids that get sent to us as they happen. When you’re slogging through a boring day at the office, seeing a happy picture of your kid on the playground with their friends is awesome. Now, let me be clear. The service works. Mostly. I mean, it functions adequately. But it’s a horrorshow of app / website design. It looks like something straight out of 2009-era iPhone development. It’s difficult to use. Crashes frequently. And from what the teachers have told me, the educator version isn’t any better. Luckily, you don’t have to use their app. You can opt-in to get all the updates and photos sent to you via email, which is what my wife and I do. But, the HTML emails they send have never rendered properly in any email client – desktop or web – that I’ve tried. But that’s fine. They may not be pleasant to look at, but I can read the information in them. My biggest gripe is that we often want to save any particularly good photos of our kids and share them with the grandparents. You can’t save the photo out of the email, because the embedded image is cropped to a square for some strange reason. You need to first tap on the image to load the full version in a browser and download it from there. Fine. But, any photo that contains any child in addition to your kid – like a group shot with a friend – is displayed with a transparent div on top of it so you can’t download it (at least on a mobile device) for privacy reasons. Look, I get it. Some parents might not want other parents unintentionally posting photos of their kids to social media. But it’s still annoying. It just forces us to take – and then crop – a screenshot. Also, the emails containing videos, which are often the best ones, can’t be downloaded at all. Last night I got frustrated enough to finally do something about this. I use Postmark to send all of my company‘s transactional emails. They’re fantastic for sending emails, but one feature they offer that I’ve never taken advantage of is handling inbound emails. You can forward any email to a secret address they provide you, and they’ll parse the email and POST all of its information as a helpful JSON object to whatever URL you specify. So, I setup a webhook in their control panel pointing to a PHP script on my web server. Then, I told Fastmail to forward all emails from the daycare service to my secret Postmark email address. You can see where this is going, can’t you? When they send a new email to my server, the PHP script finds the link in the email’s HTML content that points to the full version on the service’s website. It then downloads that web page, parses out the URL to the full image, downloads that, and saves it into a folder on my server. This works for videos, too. Next, my iMac at home runs a script every hour to download any new photos or videos from my server and puts them in a folder inside my Mac’s “Pictures” folder. 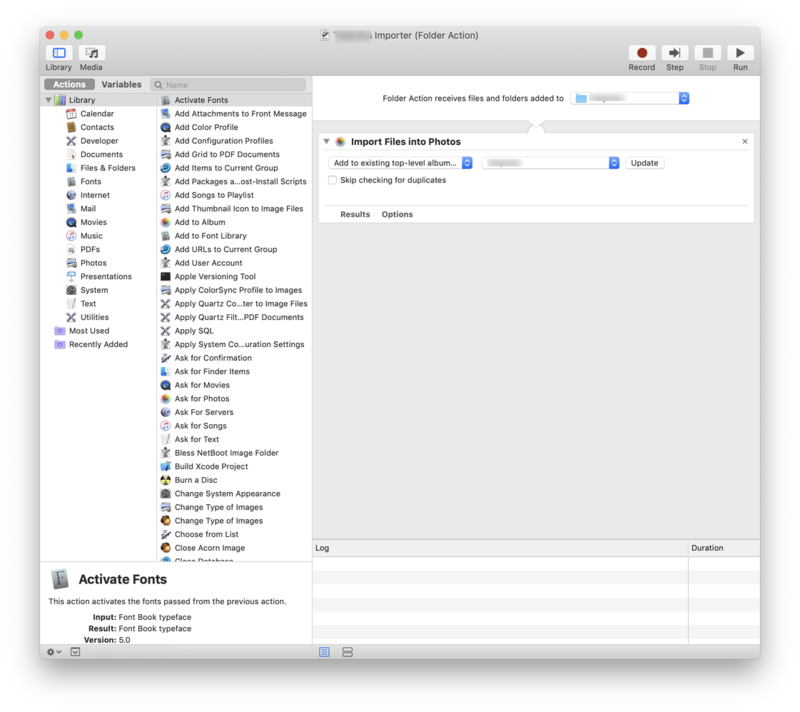 When that happens, a folder action I built with Automator automatically imports them into Apple’s Photos.app, where they’re synced to all of my mobile devices and iCloud. Soon after that, Google Photos on my iPhone will detect the new items and archive them in Google’s cloud, where they’re backed-up and made available on my wife’s phone as well. The result? We get to see all of our kids’ photos as they happen, in the nice Photos app on our phones – rather than digging through the service’s crappy emails. And, sharing the pictures with the rest of our family is a one-tap process – even for the videos which previously weren’t available at all! This entry was posted on March 29, 2019 by thall. This will take a while. Bear with me. I’m obsessive about backing up my data. I don’t want to take the chance of ever losing anything important. But that doesn’t mean I’m a data hoarder. I like to think I’m pragmatic about it. And I don’t trust anyone else to do it for me. From around 2006 to 2012, I kept a Mac mini attached to our TV with a Drobo hanging off the back. It had all our downloaded movies on it. And every night it would automatically download the latest releases of our favorite TV shows from Usenet so my wife and I could watch them with Plex the next day. It worked great, and all the media files were stored redundantly across multiple hard drives with tons of storage space. (Would it survive a house fire? No. But files like that weren’t critical.) But with the rise of streaming services and useful pay-to-watch stores like iTunes, now I’d rather just pay someone else to handle all of that for me. So, I don’t keep any media files like that locally any longer. But my email? My financial and business documents? My family’s photo and home video archive? I’m really obsessive about that. For most of my computing life, all of that data was small enough to fit on my laptop or desktop’s hard drive. In college, I remember burning a CD (not a DVD) every few months will all of my school work, source code, and photos on it for safe keeping. The internet wasn’t yet fast enough to make backing up to a cloud (were clouds even a thing back then?) feasible, so as my data grew I just cloned everything nightly to a spare drive using SuperDuper and Time Machine. It worked for the most part. Sure, I still worried about my house catching fire and destroying my backups, but there really wasn’t an alternative other than occasionally taking one of the backup drives to work or a friend’s house. But then the internet got fast, really fast, and syncing everything to the cloud became easy and affordable. I was a beta user of Gmail back in 2004. I was an early paid subscriber of Dropbox since around 2008. All of my data was stored in their services and fully available on every computer and – eventually – mobile device. At the time, I thought I had reached peak-backup. Another problem is that most of our data now is either created directly in the cloud (email, Google Docs, etc) or is immediately sent to it (iPhone photos uploaded to iCloud and/or Google Photos), bypassing my local storage. If you trust Google (or Apple) to keep your data safe and backed up, that’s great. I don’t. I’ve heard too many horror stories about one of Google’s automated AI systems flagging an account and locking out the user. And with no way to contact an actual human, you’re dead in the water along with all your data. Especially if you lose access to your primary email account, which is the key to all your other online accounts. So, I need a way to backup my newly created cloud data, too. This is getting complicated. First step. My email. This is easy. Five years ago I setup new email addresses for my personal and business accounts with Fastmail. They’re amazing. I imported my 10+ years worth of email from Google (sadly, my pre-2004 college email and personal accounts are lost to the ether), setup a forwarding rule in Gmail, and with the help of 1Password, changed all of my online services to use my new email. It took about a month to switch everything over, but now the only email coming to my old Gmail address is spam. Fastmail keeps redundant backups of my email. And I have full IMAP copies available on multiple computers in case they don’t. And if something ever goes wrong, unlike Google where their advertisers are the customer – and I’m the product – I pay Fastmail every month and can call up a live human to talk to. Back in 2006, my boss at the web agency I was working at told me about rsync.net. They provide you with a non-interactive Unix shell account that you can pipe data to over SFTP, rysnc, or any other standard Unix tool. You pay by the GB/month, and they scale to petabyte sizes for customers who need that. So, I signed up and used them to backup all of my svn (remember svn?) repos. With the rise of git and switch to GitHub, I cancelled my account and mostly forgot about them. Next up, important documents. Traditionally, I’ve kept everything that would normally go in my Mac’s “Documents” folder in my Dropbox account. That worked great for a long time. But once I started paying Google for extra storage space for Google Photos (more on that later), it felt silly to keep paying Dropbox as well. So, after 10+ years as a paid subscriber, I downgraded to a free account and moved everything into Google Drive. Sure, it’s not as nice as Dropbox, but it works and saves me $10 a month. Also, I keep all of the really important paperwork that would normally be in a fire safe in my garage in a DEVONthink library so I can search the contents of my PDFs. It’s synced automatically with iCloud and available across my mobile devices. But still, better back that up, too. So, that’s all of my data except for the big one – my family’s photo and home video archives. For a long time I kept all my family’s archives in Dropbox. I even made an iOS app dedicated to browsing your library. I could have stuck everything in Apple’s Photos.app where it’s available on my devices via iCloud, but that’s tied to my Apple ID. My wife wouldn’t be able to see those photos. Plus, any photos she took on her phone would get stored in her iCloud account and not synced with the main family archive. So, we used the Dropbox app, signed-in to my account, to backup our phones’ photos. But, like I said earlier, our photo and video library become to big to comfortably fit in Dropbox. Plus, Google Photos had just been released and it was amazing. Do I like the thought of Google’s AI robots churning through my photos and possibly using that data to sell me advertisements? No. But, their machine-learning expertise and big-data solutions make it really hard to resist. So, I spent a week and moved everything out of Dropbox into Google Photos. Now everything is sorted into albums, by date, and searchable on any device. I can literally type into their search box “all photos of my wife’s grandmother taken in front of the Golden Gate bridge” and Google returns exactly what I’m looking for. It’s wonderful. My wife’s phone has the Google Photos app installed with my account on it so every photo she takes gets stored in a shared account we can both access and view on all our devices. But what’s the recurring theme of this blog post? That’s right. I don’t fully trust any cloud provider to be the only source of my data. Someone clever said “the cloud is just someone else’s computer.” That’s exactly correct. If your data isn’t in at least two different places, it’s not really backed up. But how do I backup my 500GB+ of photos that are already in Google’s cloud? And then how do I keep new items recently added synced as well? As usual, I tried to find a way to make it work with rsync.net. I found a great open-source project called rclone. It’s a command line tool that shuffles your files between cloud providers or any SFTP server with lots of configurable options and granularity. First off, even if rclone does do what I need, I can’t just run it on my Mac. My internet is too slow for the initial backup. I need to use it on one of my servers so I have a fast data center to data center connection between Google and rsync.net. Getting it setup on one of my Ubuntu servers at Linode was a simple bash one-liner. Configuring it to then work with my Google and rsync.net accounts was just a matter of running their easy-to-use configuration wizard. Note: rclone doesn’t support a connection to Google Photos. Instead, you need to login to Google Drive on the web and enable the “Automatically put your Google Photos into a folder in My Drive” option in Settings. (And also tell your Google Backup & Sync Mac app not to sync that folder locally – unless you have the space available – I don’t.) Then, rclone can access your Google Photos data via a special folder in your Drive account. Things started out fine. But eventually, due to Google API rate limits, it was quickly throttled to 300KB/sec. That would have taken MONTHS to transfer my data. And, the connection entirely stalled out after about an hour. I even configured rclone to use my own, private Google OAuth keys, but with the same result. So, I needed a better way to do the initial import. Google offers their Takeout service. It lets you download an archive of ALL your data from any of their services. I requested an archive of my Google Photos account and eight hours later they emailed me to let me know it was ready. Click the email link to their website, boom. Ten 50GB .tgz files. Now what to do with them? I can’t download them to my Mac and re-upload them – that’s too slow. Instead, I’ll just grab the download URLs and use curl on my server to get them, extract them, and sync them over. I don’t have enough room on my primary web server – plus I don’t want to saturate my traffic for any customers visiting my website. So, spin up a new Linode, attach a 500GB network volume, and we’re in business. Right? Nope. The download links are protected behind my Google account (that’s great!) so I need a web browser to authenticate. Back on my Mac, fire up Charles Proxy and begin the downloads in Safari. Once they start, cancel them. Go to Charles, find the final GET connection, and right-click to copy the request as a curl command including all of the authentication headers and cookies. Paste that command into my server’s Terminal window and watch my 500GB archive download at 150MB(!!)/sec. Finally, rsync everything over to my backup server. And that’s where I currently am right now. Waiting on 500GB worth of photos and videos to stream across the internet from Linode in Atlanta to rsync.net in Denver. It looks like I have about six more hours to go. Once that’s done, the initial seed of my Google Photos backup will be complete. Next, I need a way to backup anything that gets added in the future. Between the two of us, my wife and I take about 5 to 10 photos a day. Mostly of our kids. Holidays and special events may produce a bunch more at once, but that’s sporadic. All I need to do is sync the last 24 hours worth of new data once every night. And, that’s it. I think I’m done. Really, this time. All of my important data – backed up to multiple storage providers – and available on all of my and my family’s devices. At least until the whole situation changes yet again. My databases are mysqldump’d every hour, versioned, and archived in S3. All of the source code on my Mac is checked out into a single parent directory in my home folder. It gets rscyn’d offsite every hour, just in case. Think of it as a poor man’s Time Machine in case git fails me. I do a lot of work in The Omni Group‘s apps – OmniFocus, OmniOutliner, and OmniGraffle. All of those documents are stored in their free WebDAV sync service and mirrored on my Mac and mobile devices. All of my music purchases have gone through iTunes since that store debuted however many years ago. I can always re-download my purchases (probably?). Non-iTunes music ripped from CDs long ago, and my huge collection of live music, is stored in iTunes Match for a yearly fee. A few years ago when I made the switch to streaming music services and mostly stopped buying new albums, I archived all of my mp3s in Amazon S3 as a backup. I need to set a reminder to upload any new music I’ve acquired as a recurring task once a year or so. Also, I have Backblaze running on my desktop and laptop doing its thing. So yeah. I guess that’s yet another layer of redundancy. This entry was posted on March 27, 2019 by thall. tl;dr One evening last week, I built pretty much the simplest URL shortening service possible. It’s simple, fast, opinionated, keeps track of click-thru stats, and does everything I need. It’s all self-contained in a single PHP script (and .htaccess file). No dependencies, no frameworks to install, etc. Just upload the file to your web server and you’re done. Maybe you’ll find it useful, too. I run a small software company which sells macOS and iOS software. Part of my day-to-day in running the business is replying to customer support questions – over email and, sometimes, SMS/chat. I often need to reply to my customers with long URLs to support documents or supply them with custom-URL-scheme links which they can click on to deep-link them into a specific area of an app. Long and non-standard URLs can often break once sent to a customer or subsequently forwarded around. I’ve used traditional link shortening services before (like bit.ly, etc), but always worried about my URLs expiring or breaking if the 3rd party shortening service goes out of business or makes a system change. Even if I upgraded to a paid plan which supports using a custom domain name that I own, I’m still not fully in control of my data. So, I looked around for open-source URL shortening projects which I could install on my own web server and bend to my will. I found quite a few, but most were either outdated or overly-complex with tons of dependencies on various web frameworks, libraries, etc. I wanted something that would play nicely with a standard LAMP stack so I could drop it onto one of my web servers without having to boot up an entirely new VPS just to avoid port 80/443 conflicts with Apache. Out of the question was anything requiring a dumb, container-based (I see you, Docker) solution just to get started. Nice-to-haves would be offering basic click-thru statistics and an easy way to script the service into my existing business tools and workflows. Admittedly, I only spent about an hour looking around, but I didn’t find anything that met my needs. So, I spent an evening hacking together this project to do exactly what I wanted, in the simplest way possible, and without any significant dependencies. The result is a branded URL shortening service I can use with my customers that’s simple to use and also integrates with my company’s existing support tools (because of its URL-based API and (optional) JSON responses – see below). Clone this repo into the top-level directory of your website on a PHP enabled Apache2 server. Import database.sql into a MySQL database. Edit the database settings at the top of index.php. You may also edit additional settings such as the length of the short url generated, the allowed characters in the short URL, or set a password to prevent anyone from creating links or viewing statistics about links. Note: This project relies on the mod_rewrite rules contained in the .htaccess file. Some web servers (on shared web hosts for example) may not always process .htaccess files by default. If you’re getting 404 errors when trying to use the service, this is probably why. You’ll need to contact your server administrator to enable .htaccess files. Here’s more information about the topic if you’re technically inclined. To create a new short link, just append the full URL you want to shorten to the end of the domain name you installed this project onto. For example, if your shortening service was hosted at https://example.com and you want to shorten the URL https://some-website.com, go to https://example.com/http://somewebsite.com. If all goes well, a plain-text shortened URL will be displayed. Visiting that shortened URL will redirect you to the original URL. Possibly of interest to app developers like myself: The shortening service also supports URLs of any scheme – not just HTTP and HTTPS. This means you can shorten URLs like app://whatever, where app:// is the URL scheme belonging to your mobile/desktop software. This is useful for deep-linking customers directly into your app. iOS Users: If you have Apple’s Shortcuts.app installed on your device, you can click this link to import a ready-made shortcut that will let you automatically shorten the URL on your iOS clipboard and replace it with the generated short link. All visits to your shortened links are tracked. No personally identifiable user information is logged, however. You can view a summary of your recent link activity by going to /stats/ on the domain hosting your link shortener. You can click the “View Stats” link to view more detailed statistics about a specific short link. Your stats pages can also be password protected. Just set the $pw_stats variable at the top of the index.php file. This project aims to be as simple-to-use as possible by making all commands and interactions go through a simple URL-based API which returns plain-text or HTML. However, if you’re looking to run a script against the shortening service, you can do so. Just pass along Accept: application/json in your HTTP headers and the service will return all of its output as JSON data – including the stats pages. Bug fixes, new features, and improvements are welcome from anyone. Feel free to open an issue or submit a pull request. I consider the current state of the project to be feature-complete for my needs and am not looking to add additional features with heavy dependencies or that complicate the simple install process. That said, I’m more than happy to look at any new features or changes you think would make the project better. Feel free to get in touch. This entry was posted on March 21, 2019 by thall. One of my favorite benefits of following a GTD workflow is that it eliminates a lot of the decision making for you. When it’s time to get work done, just fire up your task manager of choice, switch to your list of available next actions, and pick one. Having defined, physical next actions for each of your projects is the key to moving them forward. But sometimes you can get stuck and lose momentum. You may forget why a project is important. I’ve found that this can happen for long running projects or for projects that aren’t clearly defined with next actions. For the latter, the solution is simple. Move your focus all the way down your hierarchy of tasks and come up with the very next physical thing you can do to move the project ahead. No matter how small that action might be, it will count as forward progress if you do it. And that might just be enough to get you going again. But for projects and tasks that have been on your mind for seemingly ever, or for those that you just don’t remember why you signed up for them in the first place, it can be helpful to go in the opposite direction. Take a look at the task you’re procrastinating on and move up a level to its parent. Do you remember why you added that to your list? If it’s a project, are you still committed to doing it? If you’re not sure, go up another level. Is it clear why that is important to you? You can repeat this process all the way up to your areas of focus. Is it your career? Your side business? Your family? Whichever area you land on, it should be an important tent-pole in your life. You should be able to make the connection between why it is important to you and how that one small action can move you closer to your goal. And, hopefully, that’ll be the motivation you need to get un-stuck and moving forward again.